Hotel Cloud End Forest Resort is a colonial styled rustic resort nestled in the quaint hills of Mussoorie in Uttarakhand. Mussoorie is also known as the Queen of Hills which is an epitome of natural beauty. The resort has 400 acres of private Wild Life estate of thick vegetation, 104 species of fauna and 44 species of flora. The hotel is surrounded by benedictory pines, old oaks and tall fir trees. The guests can have a romantic walk in the beautiful trails, go for hiking, trekking and explore the rich bio diversity of the heavenly place. 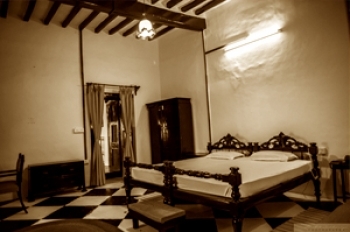 The charming hotel was built 175 years ago which has been recently furnished to provide a comfortable stay. The misty hills looks sublime when it is covered with silvery sheet of ice. The place looks like the abode of Aphrodite the Goddess of love and beauty. The hotel is located at 7 kms from Mussoorie near George Everest House. It is perched at an average altitude of 1,880 meters. 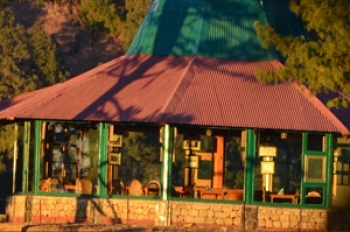 The pristine hills station is situated at the foot hills of majestic Garhwal Himalayas. The private estate possess its own nature trails which offer hiking around Benog Hill, Dudhli Village, Bhadraj Temple, Everest House and Wishing Well. This heritage property offers comfortable accommodation in 04 Heritage Deluxe Suites in the Swetenham block. The block houses 06 deluxe rooms in the annex block, an independent Log Cottage which possess 02 cabins and 10 exclusive huts which are currently under construction. The interior has a blend of traditional and modern craft which gives an authentic feel. The rooms are well furnished with modern amenities such as an attach bathroom, hot/cold running water, 24 hours power back up, EPBAX in all rooms and cable Tv. One can indulge in the serenity of this heavenly place as the bay windows offers a day breaking view of the mystic Himalayas. The hotel possess its very own restaurant known as Roses Diner. The fine dining restaurant serves delicious and appetizing vegetarian and non vegetarian dishes. The restaurant serves scrumptious Indian, Chinese and Continental cuisines to the guests. The guests can have food with their loved ones at the elegantly designed dining hall. The restaurant offers a soul refreshing view of the snow capped Himalayan peaks on the east, the Doon Valley on the south, the Winter Line to the west and the Benog Wildlife Sanctuary sprawled to the north. To make the evenings romantic bonfire is arranged which is accompanied by barbecue and soothing music. Being a popular hill station Mussoorie is well connected by motorable roads. Luxury as well as regular buses to Mussoorie are easily available from ISBT Kashmiri Gate. Buses and taxis to Mussoorie are easily availabke from major cities of Uttarakhand state like Dehradun, Rishikesh, Haridwar and Tehri. The proximity to Dehradun, capital city of Uttarakhand makes Mussoorie all the more accessible. The nearest rail head to Mussoorie is Dehradun Railway Station located about 36 km. Dehradun Railway Station is well connected by trains from major cities of India. Mussoorie is located at a favourable distance of 36 km from Dehradun Railway Station. Shatabdi Express and Mussoorie Express are the trains connecting Dehradun with major cities of India. Trains and buses are easily available from Dehradun to Mussoorie. Jolly Grant Airport at Dehradun is the nearest domestic airport to Mussoorie. It is situated at 60 km from Mussoorie and is well connected with metalled roads. Taxis are easily available from Jolly Grant Airport to Mussoorie.